After another car-versus-bicycle accident on 2nd Avenue in downtown Seattle left a female bicyclist injured Wednesday morning, the Seattle Department of Transportation (SDOT) decided to make another physical change to the high-traffic roadway in hopes of improving visibility for motorists and cyclists alike. According to The Seattle Times, an unidentified female bicyclist was struck by a car on the left-hand side of 2nd Avenue between Pike and Union at approximately 8:15 a.m. Wednesday. The bicyclist suffered a hip injury that is believed to be relatively minor. But that didn't stop SDOT officials from removing about 50 feet of parking spaces on 2nd Avenue in hopes of eliminating the risk of drivers hitting bicyclists as they attempt to cross the bike lane. A Twitter user posted the image above showing the improvements. Most early efforts to improve the bike lanefocused on the signalized intersections, which makes sense because that is how Sher Kung died just days before the new bike lane was installed. 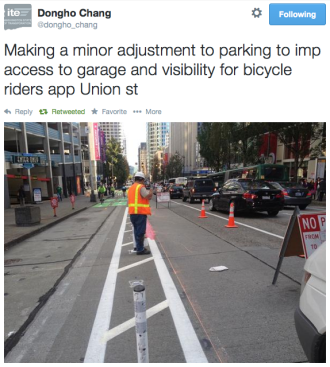 Surprised by SDOT's Quick Action? Wednesday morning's collision was allegedly caused by a driver turning across the bike lane to enter a parking garage on 2nd Avenue. These garages are often in the middle of a block and lack detailed signage that would alert drivers to look out for bicyclists and pedestrians. News reports indicate that city workers were actually out at the scene of the crash later in the day on Wednesday. SDOT apparently decided to move parking spaces further away from the garage entrance, and plans to add more signage to direct motorists to look for bicyclists and yield to anyone in the bike lane. It is quite unusual for city and government agencies like SDOT to act so quickly after a minor-injury collision like the one that took place Wednesday. The fact that the city made such a significant alteration to the roadway immediately after an accidents sheds some light on the pressure government agencies are feeling when it comes to improving transportation safety in Seattle.